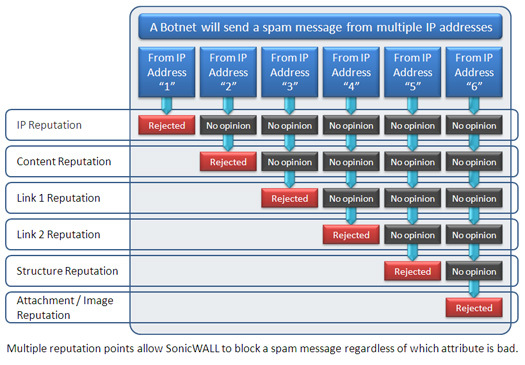 SonicWALL Advanced Reputation Management utilizes not only a message's sender IP reputation, but also the reputation of its content, structure, links, images, attachments and more. Moreover, Advanced Reputation Management also provides directory harvest attack (DHA) protection, Denial of Service (DoS) protection, backscatter/NDR protection and more, all with comprehensive logging and reporting. More than sender IP reputation. 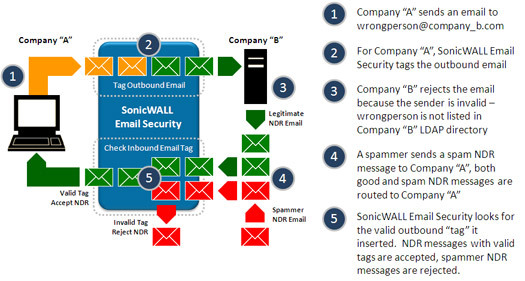 SonicWALL keeps reputation scores for multiple elements of an email. With traditional IP reputation, the spammer can quickly change the sending IP address to mitigate this technique. Since spammers use Botnets to distribute over 90% of spam from millions of unique systems. Sender IP Reputation reliant systems can be slow to react to spam attacks. With SonicWALL - the sender IP, links, content, structure, image, attachments, etc - all must be changed to avoid detection. 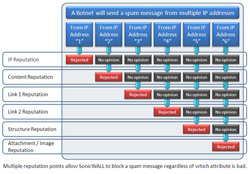 The multiple layers of reputation mean that SonicWALL protected systems present a poor target for spammers, because other systems that rely heavily on Sender IP reputation are easier to defeat. SonicWALL includes several other techniques in its connection management module. Enabling BATV ensures that NDR or Blowback spam is blocked. 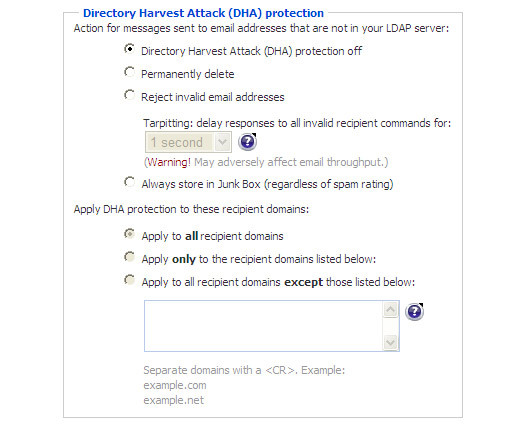 Directory Harvest Attack protection deletes, rejects or stores in a junk box, messages to users not listed in LDAP. Connection Management also includes quality of service capabilities. 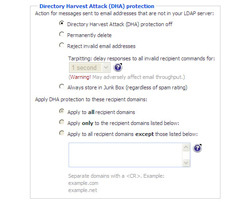 This allows an email system to protect itself against Denial of Service attacks by blocking or throttling those connections. In addition, connections from any server can be allowed, blocked throttled or rejected as desired.